Pro model surge fitted umpire cap available in Plate, Combo and Base visor lengths with "FHSAA" (Florida High School Athletic Association) logo. 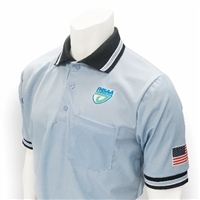 Embroidered short sleeve umpire shirt with FHSAA Shield logo on left chest, USA flag on left sleeve and FHSAA on right sleeve. 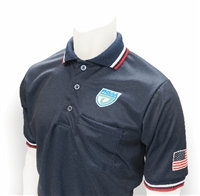 Emroidered short sleeve umpire shirt with FHSAA Shield logo on left chest and FHSAA on right sleeve. 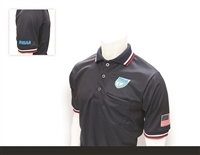 Embroidered short sleeve umpire shirt with FHSAA Shield logo on left chest and FHSAA on right sleeve. 100% polyester double mesh with taped neck. Has a Flat knit collar with 3-button placket and side vents. This is Smitty's "Elite" Interlock Performance Gray w/Black Pinstripe V-Neck shirt with FHSAA, FHSAA Shield and Flag Embroidered on it. FHSAA basketball officials Approved. 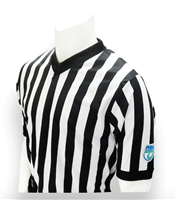 100% Made in the USA.1" V-Neck Black & White Stripes. FHSAA, FHSAA Shield and Flag with White border. Extended tail to help keep your shirt tucked in and tailored look.